Will I be rebilled or charged again for anything in the future? Absolutely Not! Our company does not operate this way, we will only charge you on what you order on your original purchase date. Our recommended dose is to take one capsule, twice a day. We recommend that you take it immediately before eating. Some people however prefer to take it with a meal. This is allowed and does not cause problems. You can take up to 4 capsules a day. Please do not exceed this amount. The product ships to all countries worldwide from our facility in the United States. We offer free international shipping for orders of 3 bottles or more. 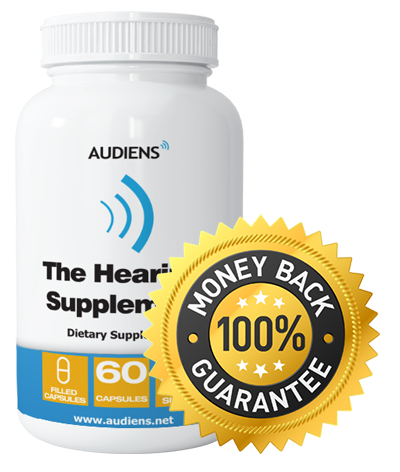 Is The Hearing Supplement safe? Yes! The Hearing Supplement is comprised of healthy, safe ingredients. No serious negative side effects have ever been reported. The product consists of ingredients that are “GRAS“. This term means “generally regarded as safe” by the United States FDA. We are legally obligated however to tell you to never take any dietary supplement without first consulting with your primary physician. The Hearing Supplement is manufactured in an FDA inspected facility that exceeds GMP standards. We stringently test for quality control to ensure that our product is safe. Can children take The Hearing Supplement? While there have never been any negative reports, we can not recommend usage by children due to the fact that the product has not been studied on them. The bodies of children can respond differently to ingredients that are normally safe for adults. What are the ingredients of The Hearing Supplement? Active ingredients: vinpocetine, L-Glutathione, Methylcobalamin, Quercetin, Alpha lipoic acid, Acetyl-L-carnitine, Magnesium Gluconate, Cholecalciferol. Inactive ingredients: Gelatin capsules, Magnesium Stearate, silicon dioxide. Yes, the ingredients of The Hearing Supplement have been studied in multiple peer reviewed research reports. Does the product replace hearing protection? No! Please, always use correct hearing protection, such as sound protective ear muffs, as necessary. It depends on what method of shipping that you choose and where you live. If you live in the USA: 1-2 days for express shipping, and 3-5 days for normal shipping. If you live outside of the US: 5-7 days average for express shipping, 1-3 weeks average for normal shipping. Unfortunately, due to every person's unique biochemistry and varying degrees of hearing problems, it is not possible to give a standardized answer. Some people have noticed improvements rather quickly, while most require a few months of treatment. We recommend that everyone start with at least 3 consecutive months of treatment and continue from there to optimize ear health and nerve functioning. This will help prevent hearing loss from worsening. Use The Hearing Supplement for at least 6 weeks exactly as suggested. If you don’t see a significant and noticeable results simply send back the unused portion (or ever just the empty containers) and get a 100% no-hassle refund.